The ▀KV-II 754(r) is a premium Rank III German heavy tank with a battle rating of 5.0 (AB) and 4.3 (RB/SB). It was introduced in Update 1.59 "Flaming Arrows". A captured KV-2 in German service, several modifications were done for the Germans' convenience. It costs 2,980 GE. The KV-II presents itself as one of the behemoth vehicles of the Rank III German tank line. With a 152 mm gun, it presents most of the pros and cons of the original Soviet KV-2 in the game. Its armament allows the vehicle to dispatch any ground vehicles in one hit. The HE and AP shells, each carrying more than 5,000 grams of explosive filler, all have the capacity to destroy a tank upon penetration or contact. However, because of the KV-II's high profile, and now added with the German commander cupola on top, the vehicle is easily targeted and attacked from a distance. The best way to take advantage of this tank is through peek-a-boom tactics and staying behind others. Roll forward, take your shot, and then pull back for the over half-minute reload time, and then repeat. 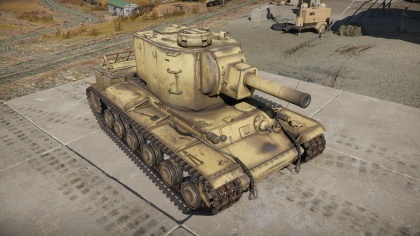 The KV-II is distinguishable by its Dunkelgelb yellow coat, instead of the green coat the Russians use on their tanks. If yellow coat is covered with a different camouflage skin, other features to look out for is the German cupola on top that looks like its from a Panzer IV. There are also a large collection of the German "jerry" fuel cans on the right rear hull, on top of the tracks. The front hull is also absent of a headlamp, though the vehicle horn is still present. Finally, there is an empty bustle rack on the rear of the tank that is not present on other KV-2 variants. The gun on this tank is what makes it special, the 152mm howitzer is capable of destroying any tank in the game (OF-530), and many with a single hit. Most times even if a shot does not destroy the target, it will damage it enough to force the foe to disengage. High Explosive is the preferred shell able to destroy almost any tank in a single shot. In order to accomplish this aim for the roof of a tank or under it and let the fragment penetrate the roof/floor. The shockwave is powerful enough to rip through up to 75mm of armour, and has a huge blast radius. You can, and will, destroy tanks such as Tigers and IS-1s with the KV-2. Again: The greatest weakness of this tank is it extremely long reload time leaving you a sitting duck for long periods of time. Basically, the strategy is to come out aim carefully at closest target and fire, and then pull back behind cover or friendly tanks. This cannot be said enough. Albeit being a heavy tank, it must rely on cover by other threats to scare the enemy away or force them to shoot another target. Mobility is that of a KV-1 powerplant, but with six more tons added. This causes the KV-2 to feel sluggish, especially in turns as a prolonged turn radius would sap the speed of the vehicle. This means hull-turns are not reliable and combined with the turret's low traverse speed, equals a poor reaction to an unexpected enemy at the flanks. Armour on the KV-II is not as reliable as the earlier KV-1 vehicles as the new BR causes it to meet Rank III vehicles with stronger guns able to penetrate through the front hull and turret armour of the KV-II. Though the relatively unsloped front hull presents a large target, the KV-II's usage of the mod. 1940 turret design presents an even larger target above the front hull, as right under the gun mantlet holding the 152 mm gun is a very flat 75 mm plate for the turret front armour, easily penetrated by even Rank II vehicles. 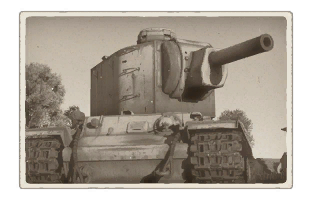 As for the profile of the vehicle, the KV-II is just tall and will always expose itself heavily when bringing its gun to aim. However, this profile is worsen by the addition of a German cupola to the top, which is even more weakly armoured than the turret and could cause exploding shots to reach in and severely damage the turret crew. Suspension wheels are 20 mm thick, torsion bars are 20 mm thick, and tracks are 30 mm thick. The "Anti-Concrete" round has the same speed as the HE shell with decent amount of penetration for nearly all rank III tanks. In ranges greater than 1000m, the OF-530 shell should be loaded to effectively deal with any vehicle including heavy tanks. Compared to the PB-35, it has much greater speed, improving long range accuracy. The "High-explosive" shell requires careful aim as despite its infamous power, a solid hit on the front of an enemy tank would not necessarily defeat the enemy. One must preferably aim beneath tanks or below the gun mantlets to sneak into thinly armoured portions such as the roof or belly armour. The shell with the most penetration on all ranges and the one with the worst accuracy, given due its abysmal slow velocity of 436 m/s (975 mph). Thus it is not advised to be used, except in close range combat. Ammo rack of KV-2 (1939). Make sure to plan your route ahead of time make sure to avoid large distances in the open, this is a slow moving tank with a large profile making it an easy target for long barreled guns. Mobility is not a strength of this tank with slow acceleration coupled with a low hull traverse and gun elevation/depression, these aspects of the tank make close range brawling a bad idea. As for top speed in a straight line on flat ground this tank can achieve 30kph. The KV-2 is best used in medium to long range, or in close combat with a second squad mate, where if you fail to destroy a target you can seek cover to reload. It's almost always advisable to be with friendly tanks when taking out the KV-2, because of it's long reload. As for the armour you can bounce shots but don't rely on your armour to save you, since the enemy its faces can pierce its armour even at range. Don't forget that in the half-minute period between your shots enemy tanks can shot you 2 or more times. The KV-II, while able to destroy most enemies in one hit, is very vulnerable to return fire as its armour is easily penetrable by its enemies at the BR. The 76 mm in the Americans, the long 75 mm and 88 mm in the Germans, the 85 mm in the Russians, and the Type 5 guns in the Japanese are able to blast through the front, unsloped armour of the vehicle to deal a mortal blow. That said, even fast vehicles with weaker guns could travel faster than the KV-2's 152 mm turret traverse and even the gun depression in close range to be immune and free to plink away at the KV-II. The target lead indicator make the slow, but long range penetrating PB-35 a destructive force to be afraid of. On more open maps like Karelia and Carpathians, the KV-II can hang back (mostly due its speed) and snipe of unsuspecting targets while being itself mostly immune to return fire. Smaller maps benefit the low shell velocity due to closer engagement distances, but also empowers the enemy medium tanks who will have it much easier to get juicy shots into your side. Situational awareness is the key to victory or rather survival. The KV-II's best friend are the binoculars. Keep the turret in a well angled position while scouting for targets with your glasses or normal eyesight. Unfortunately, in this mode the PB-35 is practically useless as the usual fighting ranges exceed 600m and without aim assistance getting hits with this howitzer are rare. Exceptions are town fights, but CQC is nothing a lone KV-2 should indulge in. A case could be made to focus on the OF-530 HE shell on long ranges. Not to destroy the enemy, but to track them and then sent a nice and juicy G-530 AC shell afterwards. Do not forget: G-530 and OF-530 share the same ballistics, if one hits the other one is likely to hit in the same wide area. Getting close: Probably the most difficult part, if spotted a 40 kg shell with your name and address is coming for you. Thus sneaking up, or attacking from outside the KV-2's field of view is advised. Of course after the HE-trash-can has left the barrel a window of opportunity and hope will open up for you. With moving up and aiming two shots can be placed on the moving Soviet tower tank. An attack route from the side or rear is preferable, not only are you hidden, but the turret traverse is so awful on the KV-2 that it will not have the time to react fast enough. Just make sure to hit, or you are in a world of pain as soon™ as it tank gets its chassis traverse to speed. Blue = bad, Red = Shoot me! Shooting: Targets should be the gunner (right side) to stop the loading process (yes, weird mechanic) and the loader (left and right) to reduce loading time. If shooting HE filled AP shells two penetrating hits will often take out the gun breach as well, stopping reload and return fire ability entirely. The easiest way of performing these hits is via the turret ring which will always not be angled at certain parts from the front. If APHE shells hit below the side hull, it will possibly detonate the main storage of ammunition, resulting in an ammo rack detonation. If that is not the case the gunner, commander, cannon breech, loader, and ammunition and turret ring will be damaged or wounded. Shooting a KV-2 from the side is much easier, just one massive turret reaching into the sky. But do not shoot anywhere! The tracks will often eat shots and most KV-2 drivers are by now smart enough to not fully load up their KV-2, leaving the rear turret empty of shells. The start of the KV heavy tanks began after the heavy tank T-35 flaws came to light. Designers were ordered to draw up new designs to become the basis of a breakthrough heavy tank needed for the Soviet doctrine. This made for a tank that was heavily armoured, but not very mobile as it was to be for siege warfare. The designs offered all had heavy armour, wide tracks, and used the torsion-bar suspension. The designs were the SMK, T-100, and what would be the KV-1 tank, which was named after the then Soviet Defense Commissar Kliment Voroshilov. During the developmental progress, the prototypes of all these heavy tanks were made and the Winter War with Finland was on its way. The Soviets sent these tanks into Finland for combat testing, to which the KV design outperform in every way with its superior armour and firepower. The armour on the KV tank was impenetrable by an tank cannon in service and most anti-tank guns as well, the 76.2 cannon also gave it a huge firepower boost compared to the usual 37 mm in use by other countries. However, the design was found to be difficult to steer, the transmission was unreliable, ergonomics was poor and vision was limited, plus with its 45 ton weight, it was a very heavy tank for its time. In truth, while formidable in power and protection, courageous crew member willing to curse the name would speak out about the trouble the KV tank really was. The main variant of production before World War II broke out was the KV-1 model. Despite its superiority on the battlefield, some observed that the KV-1's armament was not enough to destroy some of the Finnish fortifications that they encountered. For this, a request to mount a 152 mm howitzer on the KV-1 was made, and resulted in the KV-2 with its extremely large turret and an increased weight of 52 tons. The KV-2 suffered from a very high profile, low speed, and was too turret heavy. Compared to the KV-1 height of about 9 feet, the KV-2 was at 11 ft. tall. The increased weight of the tank slowed it down drastically, and the very heavy turret mixed with a low-powered traverse speed meant that the KV-2 can only traverse on level ground, as a slope would cause the turret to start turning with gravity. The combat ineffectiveness and flaws of the KV-2 came to light, and was only put on limited production due to them, resulting in only about 334 units being produced from 1939 to 1941. During the opening stages of Operation Barbarossa, the KV tanks came as a huge surprise from the Germans as they had no prior intel about these tanks, resulting in a lack of capable anti-tank weapons that could destroy these tanks aside from 88 mm Flak guns. The KV-2 served alongside the KV-1 in stalling the German Offensive to Moscow. During the Battle of Raseiniai, in Lithuania, a single KV-2 was able to hold up the entire 6th Panzer Divison for a full day by firing at them from a concealed location before it ran out of ammunition, ending with about two dozen tanks destroyed. Only one KV-2 is left intact as a survivor of the war, it is housed at the Central Armed Forces Museum in Moscow. This page was last edited on 14 March 2019, at 21:02.